The June 1962 Alcatraz escape attempt was an escape from Alcatraz Federal Penitentiary in San Francisco Bay attempted by inmates Frank Morris, John Anglin, and Clarence Anglin. The three men were able to escape from their cells and leave the island in a makeshift raft. Whether they reached land is unknown. Morris and the Anglins attempted escape on June 11, 1962. Behind the prisoners' cells in Cell Block B (where the escapees were interned) was an unguarded three-foot (0.9 m) wide utility corridor. The prisoners chiselled away the damaged concrete from around an air vent leading to this corridor, using tools such as a metal spoon soldered with silver from a dime and an electric drill improvised from a stolen vacuum cleaner motor. The noise was disguised by accordions played during music hour, and the progress was concealed by false walls which, in the dark recesses of the cells, fooled the guards. The escape route led up through a fan vent; the prisoners removed the fan and motor, replacing them with a steel grill and leaving a shaft large enough for a prisoner to enter. Stealing a carborundum abrasive cord from the prison workshop, the prisoners then removed the rivets from the grill. In their beds, they placed papier-mâché dummies made with human hair stolen from the barber shop. The escapees also constructed an inflatable raft over many weeks from over 50 stolen raincoats, which they prepared on the top of the cellblock, concealed from the guards by sheets which had been put up over the sides. Late on Monday, June 11, the three inmates tucked dummy heads resembling themselves into their beds, broke out of the main prison building via the unused utility corridor, and departed from Alcatraz Island aboard an improvised inflatable raft to an uncertain fate. The FBI investigation was aided by another prisoner, Allen West, who was part of the escapees' group but was left behind. West's false wall kept slipping so he held it in place with cement, which set. When Morris and the Anglins accelerated the schedule, West desperately chipped away at the wall, but by the time he got out, his companions were gone. Hundreds of theories have been pursued by the FBI and local law enforcement officials in the ensuing years. In 1979, the FBI officially concluded, on the basis of circumstantial evidence and a preponderance of expert opinion, that the men drowned in the frigid waters of San Francisco Bay while trying to reach the mainland. The U.S. Marshals Service case file remains open and active, however. Morris and the Anglin brothers remain on its wanted list. Circumstantial evidence uncovered in the early 2010s seemed to suggest that the men had survived, and that contrary to the official FBI report of the escapees' raft never being recovered and no car thefts being reported, a raft was discovered on nearby Angel Island with footprints leading away, and a car, a 1955 blue Chevrolet, had been stolen by three men, who could have been Morris and the Anglins. Relatives of the Anglin brothers presented further circumstantial evidence in the mid-2010s in support of a longstanding rumor that the Anglin brothers had fled to Brazil following the escape; a facial recognition analyst concluded that the one piece of physical evidence, a 1975 photograph of two men resembling John and Clarence Anglin, did support that conclusion. Of the 36 inmates who staged 14 escape attempts over the 29 years that Alcatraz served as a federal penitentiary, twenty-three were recaptured, six were shot and killed, two drowned, and five (three being Morris and the Anglins and the other two being Theodore Cole and Ralph Roe) are listed as "missing and presumed drowned". Frank Lee Morris (September 1, 1926 – disappeared June 11, 1962) was born in Washington, D.C.. He was abandoned by his mother and father during his childhood, and orphaned at age 11, and spent most of his formative years in foster homes. He was convicted of his first crime at age 13, and by his late teens had been arrested for crimes ranging from narcotics possession to armed robbery. He spent most of his early years in jail serving lunch to prisoners. As he got older he was arrested for grand larceny in Miami Beach, for stealing cars and armed robbery. The associate warden's record card at Alcatraz Prison lists his "Crimes Involved" as "Juv. Deliq.-2; Runaways-2; Breaking & Entering-1; Burglary-1; Narcotics & Armed Robbery-1; Unlawful Flight, Mann Act, & Bank Robbery-1." Morris reportedly ranked in the top 2% of the general population in intelligence, as measured by IQ testing, displaying an IQ of 133. He served time in Florida and Georgia, then escaped from the Louisiana State Penitentiary while serving 10 years for bank robbery. He was recaptured a year later while committing a burglary, and sent to Alcatraz on January 20, 1960 as inmate number AZ1441. The Anglin brothers, John William (May 2, 1930 – disappeared June 11, 1962) and Clarence (May 11, 1931 – disappeared June 11, 1962) were born into a family of thirteen children in Donalsonville, Georgia. Their parents, George Robert Anglin and Rachael Van Miller Anglin, were seasonal farm workers; in the early 1940s, they moved the family to Ruskin, Florida, 20 miles south of Tampa, where the truck farms and tomato fields provided a more reliable source of income. Each June they migrated north as far as Michigan to pick cherries. John and Clarence were reportedly inseparable as youngsters; they became skilled swimmers, and amazed their siblings by swimming in the frigid waters of Lake Michigan as ice still floated on its surface. Clarence Anglin was known to have a tattoo of "Zona" on his left wrist and one of "Nita" on his right upper arm. The brothers worked as farmers and laborers. Clarence was first caught breaking into a service station when he was just 14 years old. They began robbing banks and other establishments as a team in the early 1950s, usually targets that were closed, to ensure that no one got injured. They claimed that they used a weapon only once, during a bank heist – a toy gun. They were arrested in 1958 after robbing the Bank of Columbia branch in Columbia, Alabama. 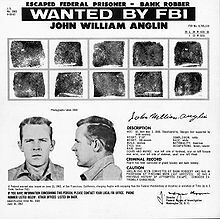 In 1958 John Anglin robbed the Columbia, Alabama, Columbia Savings Bank Building with a toy gun together with his brothers Clarence and Alfred. Both received 15-to-20-year sentences, which they served at Florida State Prison, Leavenworth Federal Penitentiary, and then Atlanta Penitentiary. After repeated failed attempts to escape from the Atlanta facility, the brothers were transferred to Alcatraz. John arrived on October 24, 1960, as inmate AZ1476, and Clarence on January 10, 1961, as inmate AZ1485. Allen Clayton West (March 25, 1929 – December 21, 1978) was born in New York City. He was imprisoned for car theft in 1955, first at Atlanta Penitentiary, then at Florida State Prison. After an unsuccessful escape attempt from the Florida facility, he was transferred to Alcatraz in 1957 and became inmate AZ1335. When West was transferred to Alcatraz, he was 28 years old, and had the education of an eighth grader. West was arrested over 20 times throughout his lifetime. Escapee's prison cell, with widened vent opening beneath the sink. The four inmates began formulating an escape plan, under the leadership of Morris, the orchestrator of the operation, after they were assigned adjacent cells in December 1961. (Additionally, some of the men may have known one another due to being incarcerated together at the federal penitentiary in Atlanta.) Working at night over the subsequent six months, they gradually widened ventilation duct openings in their cells' walls, using saw blades they found discarded on the prison grounds, spoons stolen from the commissary, and a drill improvised from the motor of a broken vacuum cleaner. They concealed the holes with cardboard and paint, and their work noise with Morris' accordion playing. The widened holes opened into an unguarded utility corridor behind the cell tier. From the corridor they climbed to the roof of their cell block, inside the building, where they set up a small workshop. There, they assembled a variety of stolen and donated materials, including more than 50 raincoats that they crafted into makeshift life preservers, based on a design they saw in Popular Mechanics, and a 6-by-14-foot (1.8 by 4.3 m) rubber raft, the seams carefully stitched together and sealed with heat from nearby steam pipes. They stole a small accordion-like concertina from another inmate to serve as a bellows to inflate the raft, and built makeshift paddles from scrap wood and stolen screws. Finally, they climbed a ventilation shaft leading to a large fan and grille on the roof and cut away the rivets holding both in place. Dummy head found in Morris' cell. The broken nose resulted when the head rolled off the bed and struck the floor after a guard reached through the bars and pushed it. 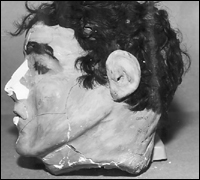 The men concealed their absences while working outside their cells—and after the escape itself—by sculpting dummy heads from a home-made papier-mâché-like mixture of soap, toothpaste, concrete dust, and toilet paper, and giving them a realistic appearance with paint from the maintenance shop and hair from the barbershop floor. With towels and clothing piled under the blankets in their bunks and the dummy heads positioned on the pillows, they appeared to be sleeping. On the night of June 11, 1962, with all preparations completed, the men initiated their escape. West had used cement to shore up crumbling concrete around his vent opening, and it had hardened, narrowing the hole and fixing the grill in place. By the time he was able to remove the grill and re-widen the hole sufficiently, the others had left without him; he exited to the roof, then returned to his cell around sunrise and went to sleep. West later cooperated fully with investigators, giving them a detailed description of the escape plan, and as a result was not punished for his role in it. Unguarded utility corridor behind the escapees' cells. From the service corridor, Morris and the Anglins climbed the ventilation shaft to the roof. Guards heard a loud crash as they broke out of the shaft, but since nothing further was heard, the source of the noise was not investigated. Hauling their gear with them, they descended 50 feet (15 m) to the ground by sliding down a kitchen vent pipe, then climbed two 12-foot (3.7 m) barbed-wire perimeter fences. At the northeast shoreline, near the power plant—a blind spot in the prison's network of searchlights and gun towers—they inflated their raft with the concertina. At some time after 10 p.m., investigators estimated, they boarded the raft, launched it and departed toward their objective, Angel Island, two miles to the north. The escape was not discovered until the morning of June 12, 1962, due to the successful dummy head ruse. An extensive air, sea, and land search involving multiple military and law enforcement agencies was conducted over the next 10 days. On June 14, a Coast Guard cutter picked up a paddle floating about 200 yards (180 m) off the southern shore of Angel Island. On the same day in the same general location, workers on another boat found a wallet wrapped in plastic containing names, addresses, and photos of the Anglins' friends and relatives. On June 21, shreds of raincoat material, believed to be remnants of the raft, were found on a beach not far from the Golden Gate Bridge. The following day, a prison boat picked up a deflated life jacket made from the same material 50 yards (46 m) off of Alcatraz Island. No other physical evidence of the men's fate was ever found. The FBI authorities were certain the men had drowned. They cited the fact that "the individuals' personal effects were the only belongings they had, and the men would have drowned before leaving them behind." However, when authorities searched for bodies, none were found. Patrick Mahoney, who ran the launch that traveled between Alcatraz and the mainland, had some doubts that the men perished, saying "I felt that they didn't make it, but I thought we'd find a body. We didn't find a body". As U.S. Marshal Michael Dyke told the news, the bodies of two out of every three people who go missing in San Francisco Bay are eventually recovered. During the investigation, Robert Checchi, a San Francisco police officer, said that at 1 a.m. on the morning of June 12th, he saw an illegal boat in the bay near Alcatraz. A few minutes later, the boat left heading under the Golden Gate Bridge. This had led to speculation that the prisoners had outside confederates to pick them up by boat. During the investigation, the FBI dismissed Checchi's account out of hand. According to FBI reports, on July 17, 1962, a month after the escape, a Norwegian ship, SS Norefjell, spotted a body floating in the ocean 15 nautical miles (28 km; 17 mi) from the Golden Gate Bridge. The ship did not retrieve the body and did not report the sighting until October. San Francisco County Coroner Henry Turkel cast doubt on speculation that it could have been one of the escapees, emphasising the improbability that a body would still be floating on the surface of the ocean after more than a month; instead, Turkel proposed that the corpse may have been that of Cecil Phillip Herrman, a 34-year-old unemployed baker who had committed suicide by jumping from the Golden Gate Bridge five days earlier. Several coroners from neighbouring counties challenged Turkel's opinion, stating that it was possible the remains had belonged to one of the escapees. Human bones were located eight months after the escape, having washed up on the shore to the north of the Golden Gate Bridge at Point Reyes, near the place where the Norwegian ship had spotted a body. The bones were recovered and buried under the name "John Bones Doe". At the time, a pathology report on the bones indicated that they had belonged to a man of Morris' age and height, but were otherwise inconclusive. FBI investigators concluded that while it was theoretically possible for the inmates to have reached Angel Island, the frigid water temperature and strong currents within the bay made it unlikely. According to West, the men had planned to steal clothes and a car once they reached land, but according to the final FBI report, no auto or clothing thefts were reported in that area following the escape, despite the high-profile nature of the case. West was transferred to McNeil Island, Washington, when Alcatraz was deactivated in 1963, and later, back to Atlanta Penitentiary. After serving his sentence, followed by two additional sentences in Georgia and Florida, he was released in 1967, only to be arrested again in Florida the following year on charges of grand larceny. At Florida State Prison, he fatally stabbed another prisoner in October 1972, in what may have been a racially motivated incident. He was serving multiple sentences, including life imprisonment on the murder conviction, when he died of acute peritonitis in 1978. On December 16, 1962, inmate John Paul Scott successfully swam a distance of 2.7 nautical miles (5.0 km; 3.1 mi) from Alcatraz to Fort Point, at the southern end of the Golden Gate Bridge. He was found there by teenagers, suffering from hypothermia and exhaustion. After recovering in Letterman General Hospital, he was immediately returned to Alcatraz. It is the only proven case of an Alcatraz inmate reaching the shore by swimming. Scott's escape, undertaken in slightly more unfavorable conditions than Morris and the Anglins faced, and using a means of flotation that was far inferior to the raft constructed by Morris and the Anglins (Scott made water wings by inflating stolen rubber gloves) shook the line of reasoning that Morris and the Anglins had likely drowned. Today, multitudes of athletes swim the same Alcatraz–Fort Point route as part of one of two annual triathlon events. Because the penitentiary cost much more to operate than other prisons (nearly $10 per prisoner per day, as opposed to $3 per prisoner per day at Atlanta), and half a century of salt water saturation had severely eroded the buildings, then-Attorney General Robert F. Kennedy ordered the penitentiary closed on March 21, 1963. The FBI closed its file on December 31, 1979, after a 17-year investigation. Their official finding was that the prisoners most likely drowned in the cold waters of the bay while attempting to reach Angel Island, it being unlikely that they made it the 1.25 miles to shore due to the strong ocean currents and the cold sea water temperatures ranging between 50 and 55 degrees Fahrenheit. They believe the remnants of the raft and the wallet wrapped in plastic containing personal effects of the Anglins, was indicative that the raft had broken up and sunk after being launched from Alcatraz, and that the three convicts had tried to swim for it, before succumbing to hypothermia, and their bodies were swept out to sea by the strong current in San Francisco Bay. The U.S. Marshals Service investigation remains open, however. As Deputy U.S. Marshal Michael Dyke told NPR in 2009: "There's an active warrant, and the Marshals Service doesn't give up looking for people." Dyke also pointed out that the bodies of two out of every three people who go missing in San Francisco Bay are eventually recovered. Since the escape, there have been many reported sightings of the three men over the years as well as leads to their whereabouts. Some of these sightings were discounted but others were taken seriously. A male tipster called the Bureau in 1967 claiming to have been at school with Morris and having known him for 30 years. He said he had bumped into him in Maryland and described him as having 'a small beard and moustache', but refused to give further details. Family members of the Anglin brothers occasionally received many unsigned postcards and messages over the years. Once a card came signed "Jerry" and another "Jerry and Joe," The family also produced a Christmas card, purportedly received in the family mailbox in 1962, saying, "To Mother, from John. Merry Christmas." Another of the Anglins' 11 siblings, Robert, also said that sometimes the phone would ring and all that could be heard was breathing on the other end; Robert said, "I suppose all that could have been pranks, but maybe it was my brothers,". The mother of the Anglin brothers received flowers anonymously every Mother's Day until her death, and two very tall unusual women in heavy makeup were reported to have attended her funeral before disappearing. Federal officials say that in the mid-to-late 1960s and into the 1970s there were "six or seven" sightings reported of the Anglin brothers, all in north Florida or Georgia. Robert also said that in 1989, when the father of the Anglin brothers died, two strangers in beards showed up at the funeral home. According to Robert, "They stood in front of the casket looking at the body a few minutes ⁠— they ⁠⁠. ⁠. ⁠. wept ⁠— then, they walked out," Anglin said. In 1989, a woman who only identified herself as "Cathy" called Unsolved Mysteries tip line to report that she recognized a photo of Clarence Anglin, as a man who lived on a farm near Marianna, Fla. The brothers also were linked to the area by a woman, who recognized a photo of Clarence Anglin and said he lived near Marianna. She correctly identified his eye color, height and other physical features. Another witness identified a sketch of Frank Morris, saying it bore a striking resemblance to a man she had seen in the area. In the early 2000s, according to The New York Times best selling author Frank M. Ahearn, the US Marshals received a tip that one of the Anglin brothers was in Brazil. The US Marshals went down to Brazil and got a confirmation from a local bartender that one of the brothers was there. Deputy U.S. Marshal Michael Dyke told NPR in 2009 that he still received leads on a regular basis. The escape was investigated in a segment by Robert Stack in 1989 on Unsolved Mysteries. Two theories were tested, one by having a triathlete swim from Alcatraz to the mainland and the other having three experienced kayakers paddle the same route in a replica of the makeshift raft used by the Anglins and Morris. While the rafters failed due to their raft being unseaworthy and had to be rescued by a motorboat that was shadowing their progress, the swimmer succeeded at making it to shore. In 1993, a former Alcatraz inmate named Thomas Kent told the television program America's Most Wanted that he had helped plan the escape, and claimed to have provided "significant new leads" to investigators. He said that Clarence Anglin's girlfriend had agreed to meet the men on shore and drive them to Mexico. He declined to participate in the actual escape, he said, because he could not swim. Officials were skeptical of Kent's account, because he had been paid US$2,000 for the interview. Modern experimental and computer-simulated evidence has suggested that the ultimate outcome of the attempt may have depended on the exact time of the men's departure aboard the raft, and on whether they were sitting on top of the raft, using their paddles or partially submerged in the water, clinging to the raft and using their legs as the primary propelling force. A 2003 MythBusters episode on the Discovery Channel tested the feasibility of an escape from the island aboard a raft constructed with the same materials and tools available to the inmates, and determined that it was possible. Contrary to the inmates' intended destination after escaping Alcatraz being Angel Island, the MythBusters theorized that the escapees used the tides to go to a different location. The makeshift raft crafted and crewed by the MythBusters team successfully made it across the bay and made it to the Marin Headlands. A portion of the scale tests (cut for time but later shown in MythBusters Outtakes) also show that debris found in the bay afterwards could have been released by the prisoners and float to where they were found through strategic use of the bay's tides to throw the authorities off their trail. The mythbusters explored the idea, that the paddle that was found, floated back into the bay in the direction of Angel Island after the prisoners made it to the Marin Headlands as a way to throw the FBI off the convicts' trail. Using a scale model of the San Francisco Bay area, the tide could have washed the paddle in the direction of Angel Island if released from the Marin Headlands, but as with their theory of the how the escape could have succeeded, no concrete evidence existed to prove or disprove the theory. When the case was transferred from the FBI to the US Marshals, all the files were examined in detail on a 2011 documentary on the National Geographic Channel entitled Vanished from Alcatraz. Michael Dyke, the Deputy U.S. Marshal, discovered in the newly uncovered official records, it was reported that, contrary to the official FBI report of the escapee's raft never being recovered, a raft was discovered on Angel Island on June 12, 1962, the day after the escape, along with footprints leading away from the raft. Furthermore, the reports also claimed, that contrary to the official FBI report of no car thefts being reported, a car, a 1955 blue Chevrolet (with Californian license plate; KPB-076), had been reported stolen in Marin County the day after the escape. It was also reported that at 11:30 a.m., on June 12, a motorist in Stockton, California (80 miles East of San Francisco) reported to the California Highway Patrol, that he had been forced off the road by three men in a blue Chevrolet. This discovery prompted speculation that officials knew of the evidence suggesting the trio survived, and that a cover-up of the evidence had taken place, along with them declaring the men drowned, not only to save Alcatraz's reputation as an "escape-proof" prison, but to hope the escapees would relax and then become easier targets to find. During Vanished from Alcatraz, Marshal Dyke exhumed the remains of "John Bones Doe", and DNA from the bones was compared to a DNA sample from one of Morris's paternal relatives. The DNA did not match and so the bones were not Morris'. That same year, an 89-year-old man named Bud Morris, who said he was a cousin of Frank Morris, claimed that on "eight or nine" occasions prior to the escape he delivered envelopes of money to Alcatraz guards, presumably as bribes. He further claimed to have met his cousin face to face in a San Diego park shortly after the escape. His daughter, who was "eight or nine" years old at the time, said she was present at the meeting with "Dad's friend, Frank", but "had no idea [about the escape]". In 2012, the 50th anniversary of the escape attempt, Michael Dyke, the Deputy U.S. Marshal, conceded that he "still [receives] leads once in a while regarding the case and there are still active warrants". That same year, relatives of the Anglin brothers made public their belief that another of the Anglins' 11 siblings, Alfred, who was electrocuted while attempting to escape from Kilby Prison in Montgomery Alabama in 1964, was actually beaten to death by guards because he wouldn't help investigators locate his brothers. A 2014 study of the ocean currents by scientists at Delft University and the research institute Deltares indicates that if the prisoners left Alcatraz at 11:30 pm on June 11, they could have made it to Horseshoe Bay just north of the Golden Gate Bridge, and that any debris that were released into the bay would have floated in the direction of Angel Island, consistent with where the paddle and belongings of the prisoners' was actually found. A 2015 History Channel documentary presented further circumstantial evidence gathered over the years by the Anglin family. Christmas cards containing the Anglins' handwriting, and allegedly received by family members for three years after the escape, were displayed. While the handwriting was verified as the Anglins', none of the envelopes contained a postmarked stamp, so experts could not determine when they had been delivered. The family cited a story from family friend Fred Brizzi, who grew up with the brothers and claimed to have recognized them in Rio de Janeiro, Brazil in 1975. They produced photographs taken, they said, by Brizzi (who died in 1993), including one showing two men resembling John and Clarence Anglin and the farm near Rio where they were purportedly living. Forensic experts hired by the History Channel confirmed that the photos were taken in 1975, and asserted that the two men were "more than likely" the Anglins. The documentary also presented an alternative escape theory, involving the use of an electrical cord—which had been reported missing from the prison's dock on the night of the escape—as a tow line, attached to a passenger ferry that departed the island shortly after midnight. During the documentary, the family gave permission for Alfred Anglin's body to be dug up from the family cemetery in Ruskin, Florida. A coroner did not find any significant trauma to Alfred, confirming his cause of death was most likely electrocution, but Alfred's DNA was compared with a sample from "John Bones Doe"; It was not a match and so the bones did not belong to either Anglin brother. Art Roderick, a retired Deputy U.S. Marshal working with the Anglin family, called Brizzi's photograph of the two men "absolutely the best actionable lead we've had," but added, "it could still all be a nice story which isn't true"; or the photograph could be a misdirection, aimed at steering the investigation away from the Anglins' actual whereabouts. Michael Dyke, the Deputy Marshal assigned to the case, said Brizzi was "a drug smuggler and a conman", and was suspicious of his account. An expert working for the U.S. Marshals Service compared measurements of the photo subjects' physical features to those of the Anglin brothers' arrest photos, believed it most likely is a picture of John and Clarence Anglin; although the age and condition of the photo, and the fact that both men were wearing sunglasses, hindered efforts to make a definitive determination. Other circumstantial evidence included the deathbed confession of Robert Anglin, who is said to have told family members in 2010 that he had been in contact with John and Clarence from 1963 until approximately 1987. Surviving family members, who said they have heard nothing since Robert lost contact with the brothers in 1987, announced plans to travel to Brazil to conduct a personal search; but Roderick cautioned that they could be arrested by Brazilian authorities, because the Alcatraz escape remains an open Interpol case. In a 2016 episode of PBS' American PBS television series Secrets of the Dead, three Dutch scientists using tidal flow data tried to recreate the attempt. Creating handmade replicas of the raft and paddles, they tried for Horseshoe Bay, which they considered a more realistic landing site. While the rafters failed due to their raft being unseaworthy and had to be rescued by a motorboat that was shadowing their progress, they made it so close. In 2018, the FBI confirmed that the existence of a letter, allegedly written by John Anglin, had forced them to reopen the investigation into the case. The author of the letter, received by the San Francisco Police Department in 2013, claims that Frank Morris died in 2008, and Clarence Anglin died in 2011. He further said he had cancer, and wanted to strike a deal with the FBI — offering to be locked up again for a year in exchange for medical care. When analyzed for a link to Anglin, it was deemed inconclusive. The U.S. Marshal's office is still investigating this case, which will remain open on all three escapees until their 100th birthdays. In 2018, Christof Putzel, award-winning journalist and correspondent for Al Jazeera America, investigated the escape. Paddling with two other men in a replica of the makeshift raft used by the Anglins and Morris, they determined that due to the shifting tide, it is plausible that the trio could have paddled to Angel Island without a great degree of difficulty. Noting the documents mentioning a raft being found on Angel Island, and the 1955 blue Chevrolet being stolen, Putzel combed though hundreds of documents and discovered various reports mentioning a chevy of the same description making its way across the country over a couple months after the escape. According to one report two weeks after the escape, a Chevy was spotted in Oklahoma with men who met the description of the escapees, a Chevy discovered in Indiana, a Chevy spotted in Ohio, and in South Carolina, three months after the initial escape, three men matching the description of the Anglin brothers and Frank Morris trying to acquire a hideout in the woods. Widner had to say about Morris; "in letters and conversations I've had with certain people, there's a very good indication that he left; I did kind of hear where I thought he went". Putzel travelled to Taubaté, Brazil, where he discovered that there was a farm, called "The Farm of the Americans", and learned that residents recalled of two American men renting the farm and living there from 1965 to the 1970's and discovered the nearby site of the 1975 photograph, called El Dutra, discovering similar large termite mounds similar to the one in the photo. J. Campbell Bruce's 1963 book Escape from Alcatraz documents the 1962 escape, along with other escape attempts over the 29 years that Alcatraz Island served as a prison. The film Escape from Alcatraz (1979) stars Clint Eastwood, Fred Ward, and Jack Thibeau as Morris, John Anglin, and Clarence Anglin, respectively. West (fictionalized as a character named Charley Butts) was played by Larry Hankin. The escape was shown in a two-part 1980 TV movie made by Telepictures Corporation (now owned by Warner Bros.): Alcatraz: The Whole Shocking Story, which starred Ed Lauter as Morris, and Louis Giambalvo and Antony Ponzini as the Anglins. Terror on Alcatraz (1987) stars Aldo Ray as Morris, returning decades later to the scene of his escape from Alcatraz and scouring his old prison cell for a map to a safe deposit box key. ^ "3 Robbers escape from Alcatraz cells". Eugene Register-Guard. (Oregon). Associated Press. June 12, 1962. p. 1A. ^ "Massive search made for Alcatraz escapees". Bend Bulletin. (Oregon). UPI. June 12, 1962. p. 1. ^ "3 prisoners are missing from 'Rock'". Spokesman-Review. (Spokane, Washington). Associated Press. June 13, 1962. p. 1. ^ a b c d "A Brief History of Alcatraz". Federal Bureau of Prisons. Retrieved 6 September 2012. ^ a b c "Alcatraz – Page 6". Legendsofamerica.com. Archived from the original on 27 August 2012. Retrieved 7 September 2012. ^ a b Wang, Amy (24 January 2018). "A man claims three Alcatraz prisoners 'barely' survived a 1962 escape — and that he's one of them". Retrieved 1 February 2018. ^ a b "Alcatraz Escape". FBI Records: The Vault. Retrieved 2 April 2013. ^ "After 50 Years, the U.S. Marshals Remain Diligent in Hunt for Renowned Alcatraz Escapees". www.usmarshals.gov. Retrieved 2018-05-07. ^ a b c d e "Case 68: Escape from Alcatraz – Casefile: True Crime Podcast". Casefile: True Crime Podcast. 2017-11-25. Retrieved 2018-05-07. ^ a b "Investigator Says 1962 Alcatraz Escapees Likely Survived". February 8, 2011. ^ a b c Press |, Associated (June 19, 2013). "Alcatraz escapee's sister returns to robbery scene". ^ Amy Graff (October 12, 2015). "New claim: Alcatraz escapees might have survived. could still be alive". SF Gate. Retrieved October 13, 2015. ^ "50 years later, new evidence suggests 3 Alcatraz escapees may still be alive". WPIX-11. October 12, 2015. Retrieved October 13, 2015. ^ a b c d e f g h i "A Byte out of History: Escape from Alcatraz". Federal Bureau of Investigation. June 8, 2007. Archived from the original on 2008-07-09. Retrieved 2008-11-30. ^ "Alcatraz Escape Part 2 of 17" (PDF). FBI Records: The Vault. p. 52. Retrieved 2011-08-06. In 1955 Vital Statistic Records, Washington, D. C., revealed FRANK MORRIS was born September 1, 1926, Gallinger Hospital, Washington, D. C.
^ McFadden, Robert D. (June 9, 2012). "Anniversary of a Mystery at Alcatraz". The New York Times. ^ "Frank Morris Escaped From Alcatraz and Was a D.C. Native – Ghosts of DC". ghostsofdc.org. 2012-09-10. Retrieved 2018-02-19. ^ a b "The Great Escape From Alcatraz". Alcatrazhistory.com. Ocean View Publishing Company. p. 1. Retrieved July 23, 2014. ^ "Frank Morris Escaped from Alcatraz and Was a D.C. Native". 2012-09-10. ^ McFadden, Robert D. (June 9, 2012). "Tale of 3 Inmates Who Vanished From Alcatraz Maintains Intrigue 50 Years Later". New York Times. Retrieved June 10, 2012. ^ a b c "Former Alcatraz Inmates List". National Archives of San Francisco. National Archives. 2016-08-15. Retrieved 2 August 2018. ^ "Wanted by U.S. Marshals – Anglin, Clarence" (PDF). U.S. Marshals Service. Retrieved 2012-06-10. ^ "Clarence Anglin, John William Anglin". ruskinhistory.org. Retrieved 14 October 2015. ^ "Anglin brothers". www.RuskinHistory.org. Retrieved 8 May 2013. ^ a b "Alcatraz 50 years later". ^ "Alcatraz Escape – June 11, 1962". Alcatraz History. 2008. Retrieved 2008-12-31. ^ a b Babyak, J (2001). Breaking the Rock: The Great Escape from Alcatraz. ISBN 978-0-9618752-3-7. ^ Jolene., Babyak, (2001). Breaking the rock : the great escape from Alcatraz. Berkeley, Calif.: Ariel Vamp Press. ISBN 978-0-9618752-3-7. OCLC 47183259. ^ "Valued exposure: Escape". BBC News. June 15, 2009. Retrieved May 7, 2010. ^ Full text of Alcatraz Escape FBI Files. Archive.org, retrieved November 2, 2015. ^ Marzilli, Alan (2003). Famous Crimes of the 20th Century. Philadelphia: Chelsea House. pp. 73–75. ISBN 978-0-7910-6788-8. ^ Kerr, J. (October 17, 1993). Flight from Alcatraz. SunSentinel.com, retrieved June 7, 2016. ^ "A byte out of history – Escape from Alcatraz". Federal Bureau of Investigation. Retrieved 2011-09-02. ^ a b Leff, Lisa (2012-06-12). "Escape from Alcatraz: 50 years later, mystery remains". www.nbcnews.com. ^ "Boat, Plastic Bag Clues in Rock Break". Oakland, California: Oakland Tribune. June 17, 1962. p. 1 – via Newspapers.com. ^ Leithead, A. (June 12, 2012). Alcatraz escape still surprises, 50 years on. BBC.com. ^ Michael Esslinger (June 8, 2018). "Anglin Brothers Escape". Alcatraz Cruises. ^ a b "Alcatraz Escape Attempts". Alcatrazhistory.com. Retrieved 2011-01-24. ^ a b Company, Ocean View Publishing. "Alcatraz Prison Escapes – Page 1". www.alcatrazhistory.com. Retrieved 2017-11-29. ^ Howley, Elaine K. "The Art of the Escape". U.S. Masters Swimming. Retrieved 26 February 2017. ^ "Alcatraz - Escapes". www.notfrisco2.com. ^ Escape From Alcatraz Triathlon, retrieved November 9, 2015. ^ San Francisco Triathlon at Alcatraz Archived 2015-11-07 at the Wayback Machine, retrieved November 9, 2015. ^ Ocean View Publishing Company. "A Brief History of Alcatraz, p. 5". Alcatrazhistory.com. Retrieved July 18, 2012. ^ a b "Escape From Alcatraz And A 47-Year Manhunt". National Public Radio. 2009. Retrieved 2009-09-21. ^ "Alcatraz Escape Part 13 of 17" (PDF). FBI Records: The Vault. p. 52. Retrieved 2018-09-28. ^ a b "Revealed: FBI told two Alcatraz escapees had been seen in Rio in 1965". Mail Online. October 14, 2015. ^ a b c d "The Anniston Star from Anniston, Alabama on December 5, 1993 · Page 9". Newspapers.com. ^ a b Nolte, C. (March 18, 2013). Alcatraz escapees' family convinced brothers alive. sfgate.com. ^ "Cedar Rapids Gazette Newspaper Archives | Dec 26, 1990, p. 10". crgazette.newspaperarchive.com. ^ Higbee, A. (November 13, 1993). American Topics : Alcatraz Escapees May Still Be Alive. New York Times archive, retrieved December 10, 2015. ^ a b "Vanished from Alcatraz (2011)". Internet Movie Database. Retrieved 2011-10-22. ^ "Alcatraz 1962 Escape Possible, Say Experts". Sky News. 15 December 2014. Retrieved 17 December 2014. ^ Morelle, R. (December 15, 2014). Alcatraz 1962 escapees had small chance of success. BBC.com. Retrieved from https://www.bbc.com/news/science-environment-30349106. ^ a b Notorious Alcatraz escapees may still be on the lam (October 19, 2015). CBC.ca, retrieved November 2, 2015. ^ "YouTube". www.youtube.com. Retrieved 24 March 2018. ^ Graff, A. (October 12, 2015). "New claim: Alcatraz escapees might have survived. could still be alive". SF Gate. Retrieved October 13, 2015. ^ Staff Writer (October 12, 2015). "The picture that 'proves' two inmates DID escape from Alcatraz: Notorious escapees didn't drown, body-surfed behind a passenger ferry to freedom and started a farm in Brazil, claims family". Detroit Newstime. Retrieved October 13, 2015. ^ a b Boyle, L. (October 15, 2015). Alcatraz escapees 'had wives and children in Brazil', their family claims – and they want their sentences commuted so they can 'come home' after 53 years. The Daily Mail, retrieved November 30, 2015. ^ Noyes, D. (May 15, 2016). New leads in manhunt for Alcatraz escapees. ABCnews.com, retrieved June 15, 2016. ^ a b "Alcatraz inmates survived infamous 1962 escape, letter suggests". cbsnews.com. Retrieved 24 March 2018. ^ Bruce, Campbell J. (1963). Escape from Alcatraz. ISBN 978-1-58008-678-3. ^ McGilligan, Patrick (1999). Clint: The Life and Legend. Harper Collins (2002), p. 307. ISBN 0-00-638354-8. "FBI Investigation File 76-26295" (PDF). Federal Bureau of Investigation. Zimmerman, Keith; Zimmerman, Kent; Hyneman, Jamie; Savage, Adam; Rees, Peter (2005). Mythbusters: The Explosive Truth Behind 30 of the Most Perplexing Urban Legends of All Time. Simon & Schuster. ISBN 978-1-4169-0929-3.